We pay special attention to pressing, the first step in the vinification and future quality of our wines. More than half of our grapes are red, but we want only white juice. 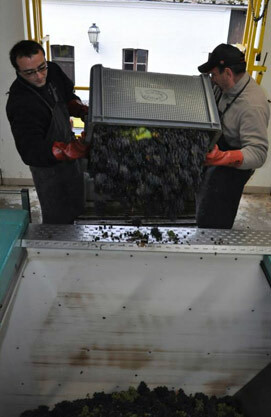 To avoid oxidation and staining by the skins, after pressing the juice drains by gravity into holding tanks. Next, this juice is divided into two fractions. The first and best, the cuvée, will be set aside for aging to bring out its character and complexity. The second, the taille, yields a more fruity, less acidic wine that can be enjoyed earlier. Three presses, one traditional and two automatic, compress the grapes slowly and evenly without bursting them, thus preserving their delicate aroma. Their size also permits us to process smaller, specific batches (i.e. vinification by parcel). Our energy-efficient, 4000 kg "Coquart" automatic presses are state-of-the-art and, in our opinion, unparalleled for maintaining integrity of the grapes. They work in perfect harmony with our traditional vertical press.